Ronald Reagan is known for many things: the actor turned President ended the Cold War and started the "War on Drugs." But did you know that Reagan also declared July National Ice Cream Month? Lots of us are lactose intolerant - up to 70%, depending on your ethnicity! Yet the dairy industry has such a powerful promotional arm (assisted, ironically, by the USDA) that most of us are still convinced that this product that's laden with pus, antibiotics, fat, and growth hormones, seems to promote the growth of certain cancer cells and which leaches calcium from bones is good for us. Dodo readers, IT ISN'T!! If you don't believe me, read more here. But aside from countless health issues, there is a second reason why dairy does not deserve its own holiday--and that, of course, is the suffering of cows. Female cows suffer greatly. 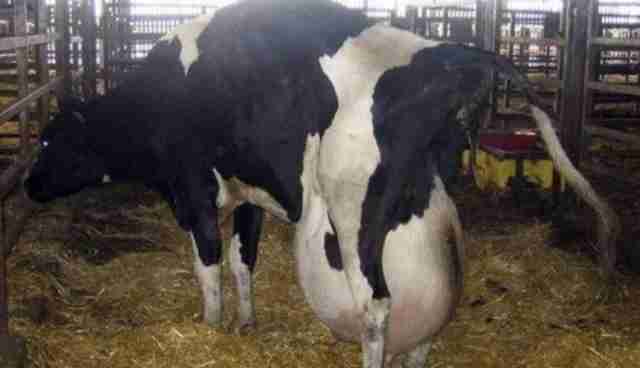 Years of constant impregnation and birth, in miserable conditions, lead to painful infections such as mastitis, seen here. 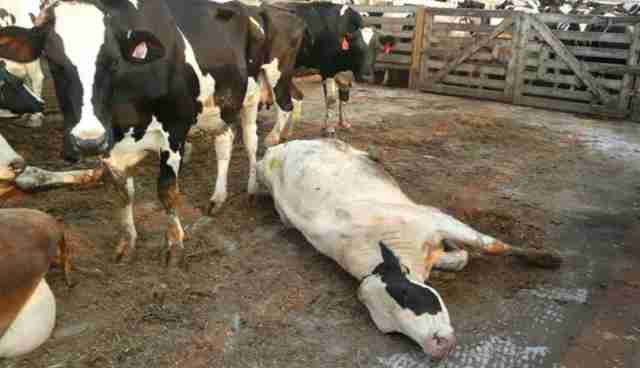 The greatest number of "downed animals" -- those who are too sick to walk and are dragged or bulldozed to a pile of other dead and dying farmed animals -- are from the cow dairy industry, which pushes female cows to the breaking point. Estimates are that 1.5% of female cows are "downed" and 14.5% suffer severe lameness. 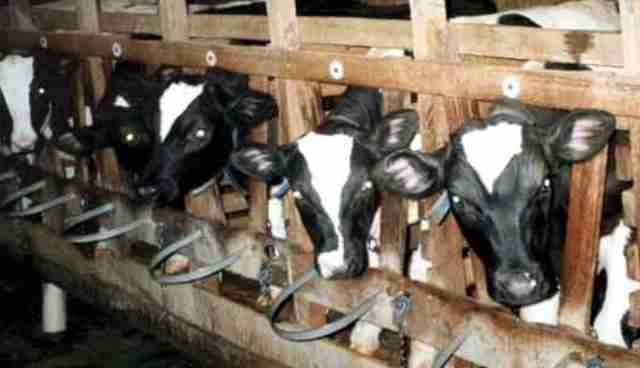 Because male calves are useless to the cow dairy industry, they become veal. 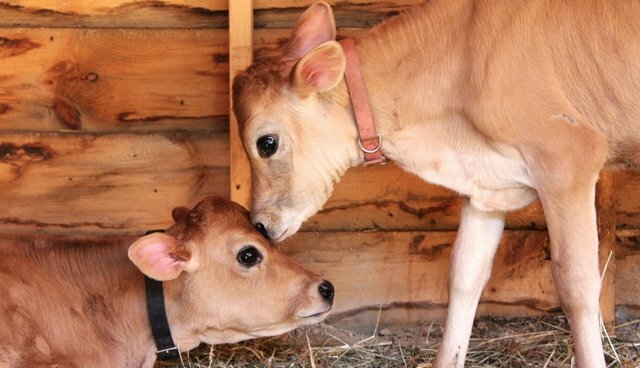 Male calves are either slaughtered shortly after birth or live short, awful lives, kept in crates where they cannot even turn around or lie down comfortably. 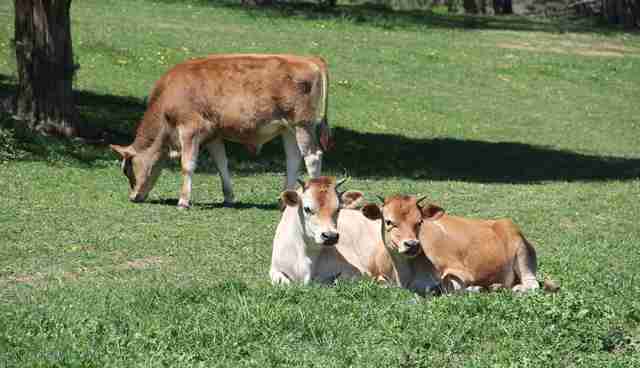 Russell, Emerson, and Bernard were gravely ill when rescued from a dairy operation. They would have died either shortly after birth or after 6 months of confinement in a tiny crate. Instead, they'll live out their lives, possibly two full decades, at CAS. Fortunately, a twist of fate allowed Rosebud, a special needs Holstein, to enjoy many happy years at CAS. Holsteins, like Rosebud, are the most popular cow breed used for milking. We know them as individuals: Russell is goofy and affectionate, Tucker is kind, soulful, and extremely emotional, Mama Sherman watches out for everyone, especially her children, Caleb and Buttercup, and Doc? Well, he's kind of a jerk--is there always one in every crowd? We would no more eat them, or their milk that's responsible for so much suffering, than we would eat our dogs or our cats. And thankfully for all of us, we can still enjoy ice cream during Ice Cream Month or at any other time of the year without participating in suffering. Today's non-dairy ice cream is delicious. Groceries throughout the country carry a wide variety of cruelty-free ice cream in various flavors. My favorite, So Delicious, is heavenly. Ronald Reagan was both revered and vilified. I wasn't a fan, but I won't hold National Ice Cream Month against him. Instead, I'll enjoy my So Delicious, and for all the right reasons, hope you'll give it a try, too.